In my last post on Arch Installation Guide , We installed the base system and we can now login into our new system as root using the password that we set. 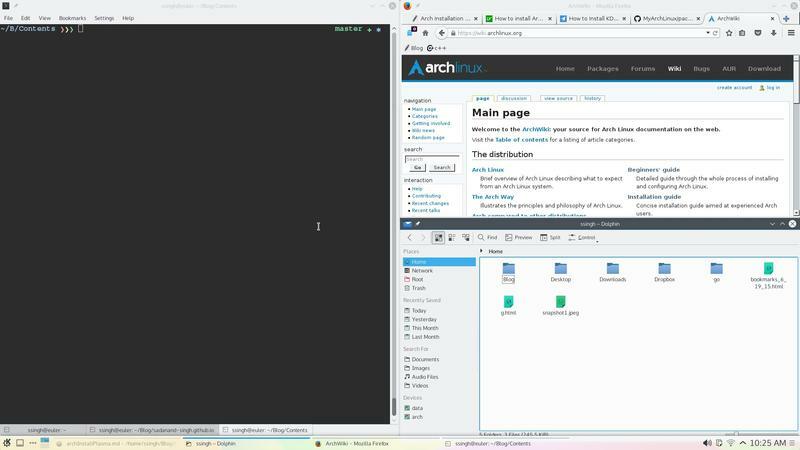 Please see my latest post on installing Arch linux with Gnome 3 for an upto date version of this guide. Now, we will proceed further to install the Plasma 5 desktop. Choose $USERNAME per your liking. I chose ssingh, so in future commands whenever you see ssingh please replace it with your $USERNAME. PING google.com (10.38.24.84) 56(84) bytes of data. If you do not get this output, please follow the troubleshooting links at arch wiki on setting up network. I will be assuming you have an NVIDIA card for graphics installation. Nvidia has a daemon that is to be run at boot. To start the persistence daemon at boot, enable the nvidia-persistenced.service. Do not have both of the above enabled at the same time. Please look at Arch Wiki for additional details. Now continue installing remaining important packages for the GUI. Now we have to setup a display manager. I chose recommended SDDM for plasma 5. If you use vim as your primary editor, you may find this vimrc quite useful. That's It. You are done. Start playing your new beautiful desktop. Please leave your comments with suggestions or any word of appreciation if this has been of any help to you. Follow this page for any additional suggestions or improvements in this guide. Hi! I'm Sadanand. I write free resources for people learning machine learning, deep learning and programming. I aspire to help hundreds of people daily. I turn down everyone who offers to put ads, affiliate links, and sponsored posts on my website.